It's Father's Day today, and by chance this week there's been a little flurry of emails about Dad's ditching of his Blenheim bomber in the bay of St-Efflam in northern France in September 1941 - almost exactly 73 years ago. Thanks to the glories of Google, two model enthusiasts in Brittany have found me and told me about the diorama that one of them is making of the scene of the plane sitting in the shallow waters of the bay, with the three crew making good their escape. The modeller had had another project in mind until his friend told him about this event, which he knew about in full detail, because his grandmother was one of the primary helpers in hiding, moving and looking after the men. 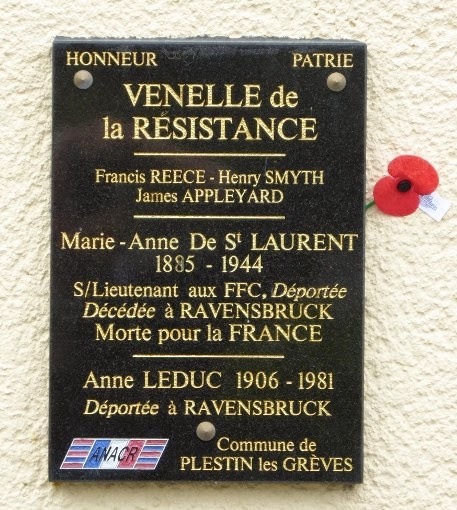 I knew her name too, because in the report Dad wrote as soon as he was liberated and returned to England in 1945, he names her, and clearly admires the spirit and bravery shown by all the women who helped them. 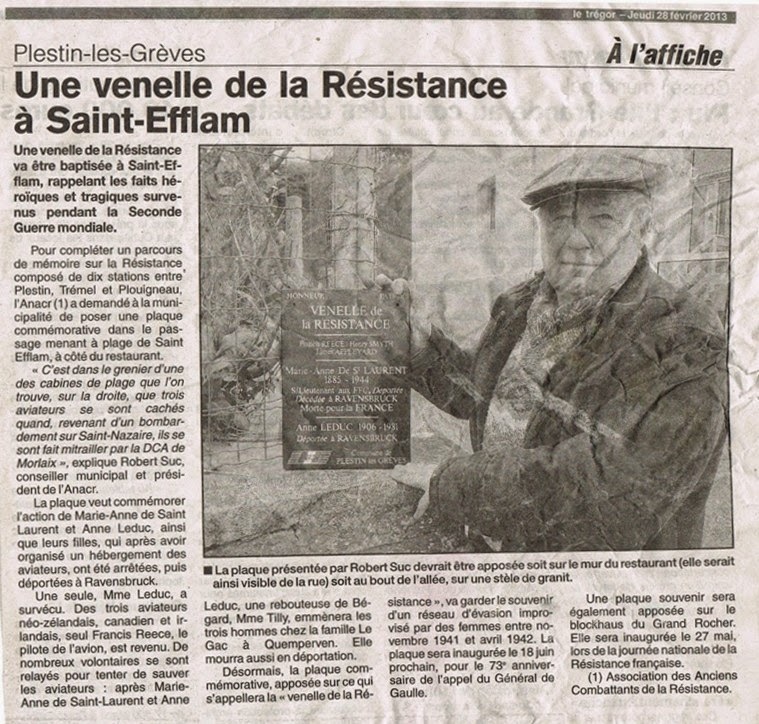 Mme de St Laurent's grandson sent me a clipping from the local paper last year, reporting that a plaque was to be erected in the alleyway in St-Efflam that leads to the beach where Dad and his crew waded ashore to hide, initially, in the roof of a hut. And this week I received a photo taken recently of the plaque by a visiting Kiwi who knew the story, and came prepared with an Anzac poppy. It feels so right to see it, and to know that those courageous women have been remembered and honoured for their sacrifice. If it weren't for them, I wouldn't have a father. In fact, I wouldn't be here at all.